Christopher R. Marshall is Senior Lecturer in Art History and Museum Studies and Art History Discipline Chair at the University of Melbourne. His publications on museums and curatorship include the edited volume Sculpture and the Museum (Ashgate: 2011) and chapters for Museum Making: Narratives, Architecture, Exhibitions (Routledge, 2012); Reshaping Museum Space: Architecture, Design, Exhibitions (Routledge: 2005), and Rethinking Art History (Routledge: 2007). 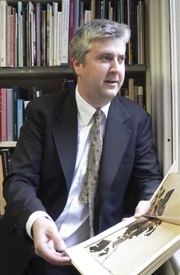 Publications in his dual specialization in Neapolitan Baroque art, collecting and the market include chapters in Painting for Profit: The Economic Lives of Seventeenth-century Italian Painters (Yale: 2010), Mapping Markets in Europe and the New World (Brepols: 2006); The Art Market in Italy (Pannini: 2002); as well as articles in The Journal of the History of Collecting, The Burlington Magazine and the Art Bulletin. He has held research fellowships at the Center for Advanced Studies in the Visual Arts, National Gallery of Art, Washington DC; Duke University, Durham North Carolina; the Museo Poldi Pezzoli, Milan; and at the Henry Moore Institute, Leeds. This paper will address the ongoing debates surrounding the Parthenon Sculptures following the inauguration of Bernard Tschumi’s New Acropolis Museum in Athens in June 2009. In particular it will consider the implications involved in the push to ‘complete’ the Sculptures by relocating them back to Athens within the newly completed Museum. One of the main arguments in favour of this proposal is that the new Acropolis Museum supposedly provides a more appropriate setting by virtue of its proximity to the Parthenon and because of the fact that the new Galleries have been designed as a 1:1 scale reconstruction of the Parthenon’s architectural footprint. In reality, however, the Acropolis Museum offers a display setting that is no more contextually accurate or ‘complete’ than the British Museum displays that precede it. Both London and Athens, rather, betray a decontextualizing emphasis that, I will argue, is intrinsic to the long traditions of museological display aesthetics that inform both contexts. This might lead us then to conclude that any unitary scheme aimed at reunifying the sculptures according to a fixed and singular ideal based on the notion of a contextualised display will be doomed from the outset. Rather, the sculptures are now historically discontinuous and reside in a series of parallel dimensions, which we encounter today equally in publications and websites dedicated to the Sculptures as much as in the actual museum spaces themselves.